Mike has wide-ranging experience in professional liability, products liability, commercial litigation, and intellectual property. He is licensed with the United States Patent and Trademark Office and a Certified Information Privacy Professional (CIPP/US). 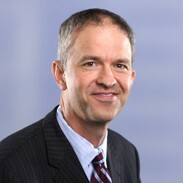 Mike is chair of the firm’s Intellectual Property Practice and CyberSecurity and Data Privacy Practice. Frey v. Shell: Defense verdict in products liability case involving alleged permanent eye injury. Freeland v. AM: Successful defense of Fortune 500 company in federal products liability trial involving disability and brain injury. Gulley v. F, M.D. : Defense verdict in malpractice case involving intra-cranial abscess. Jordan v. Maloney: Defense verdict in professional liability and fraud case against home inspector and realtor. Hoskins v. F, M.D. : Defense verdict in federal malpractice and civil rights case involving metastatic prostate cancer. Gallina v. W, M.D. : Defense verdict in malpractice case involving talar neck fracture. Bahrs v. B, M.D. : Defense verdict in federal civil rights case involving colon cancer. Magurany v. S: Defense verdict in rear-end collision resulting in partial paralysis and brain damage. Stephenson v. O, M.D. : Defense verdict in federal civil rights case involving back surgery. Three arbitration victories for a Fortune 100 Internet/Cable Company in cases involving breach of contract, fraud, and alleged violations of the Illinois Consumer Fraud Deceptive Business Practices Act. Mike received his Bachelor of Science degree in electrical Engineering from the University of Notre Dame, and he worked as an electrical engineer at Ralston Purina in St. Louis prior to attending law school. He received his J.D. degree (Order of the Coif) from the University of Missouri School of Law. After receiving his law degree, Mike served as a judicial clerk to Federal District Judge Richard Mills in Springfield, IL. Following that clerkship, he worked in private practice in Springfield, primarily in the areas of medical malpractice, products liability, and commercial litigation. He joined Heyl Royster in 2000 and moved to the firm's Edwardsville office in 2003. Mike became a partner with the firm in 2004, and he returned to the firm’s Springfield office in 2011.